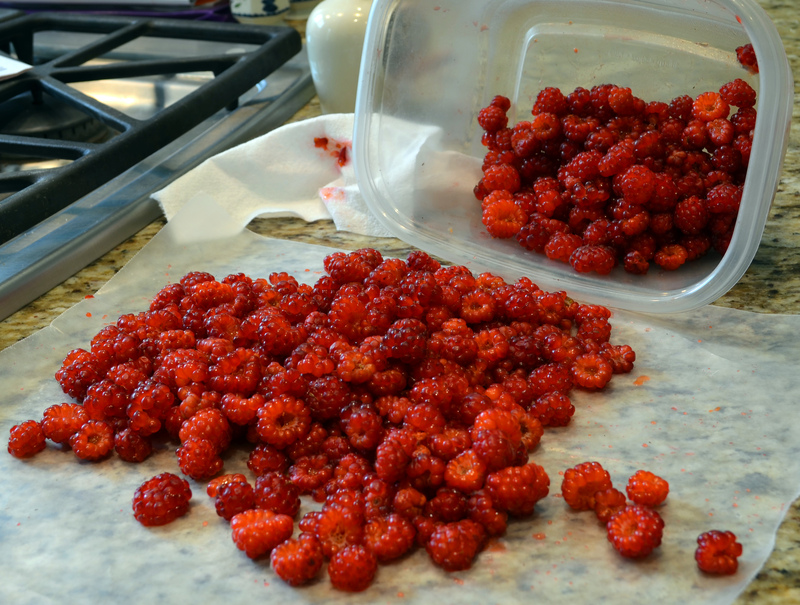 I posted earlier than we have our first harvest of raspberries this month on last year’s canes (type = Heritage). I like to leave these raspberries on the bush as long as possible in order to harvest @ max sweetness. This is all fine as long as you pick twice a day, a thorough one in the morning and a second “clean up” pick in the evening. This works if the schedule is kept diligently, especially when riding the crest of the harvest wave when everything seems to be ripening at the same time. Saturday, I didn’t pick twice; the evening pick just didn’t happen for some reason. Honestly I don’t recall for sure that much of a morning pick took place. (Too distracted trying to finish the last of the storm damage repairs). So yesterday I did a thorough “clean up and recovery” harvest, where anything edible was picked and the rankest ones were removed and disposed of as much as possible. My plan was to freeze the harvest immediately but I wasn’t certain I had avoided all the bad ones, so I dumped the juicy pile out on wax paper and sorted them accordingly; there were a couple dozen that I had missed that had the potential of ruining the whole lot if not removed. I have to be more diligent as the harvest wanes; it was NOT pleasant to toss all those wasted and rotting berries.